Each one is completely hand made, the body is shaped with wire framing mesh and small shards of CDs and DVDs have been cut up and added to the frame with hot glue. The effect is quite interesting as the shards create an organic shape that catches and reflects light brilliantly. 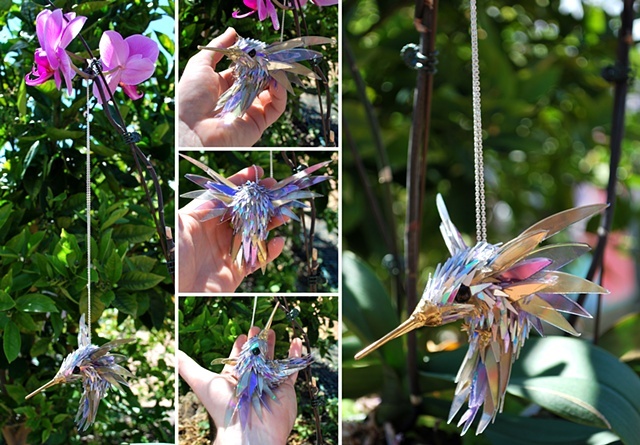 CDs and DVDs come in many different colours, this bird is made from purple and gold ones. Send me a message if you'd like me to make something with some different colours, I can do gold, blue, green, purple and silver and any combination of those.